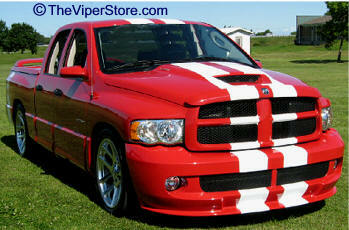 Dodge Ram SRT10 Truck "Tough-looking" with this awesome Rally Stripe graphics kit. High quality top of the line Vinyl. 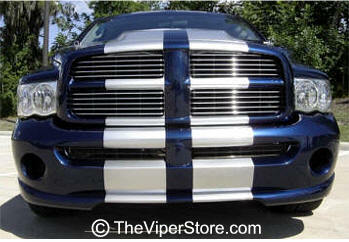 This stripe package is not just a set of 10.875" (27.62cm) strips in a box. 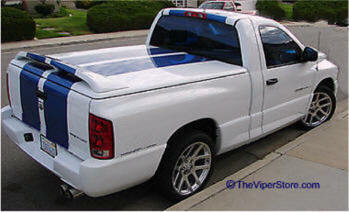 Our graphic kit consists of pre-fitted and contoured pieces as shown in the illustration. 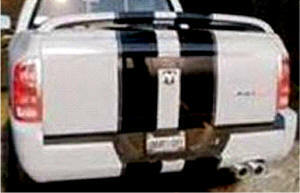 Rally stripes are set for 6" (15.24cm) center spacing at time of installation. 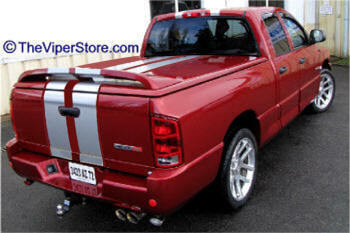 Kit is specifically made for the 2004-2006 Dodge Ram SRT10 8.3L Truck factory bumper, grille hood, roof and tailgate areas and will not fit any other vehicle.